Primary infection in any host often goes unrecognized. In ~ 10% of immunocompetent individuals, it causes a self-limited and nonspecific illness that rarely requires treatment. The most frequently observed clinical manifestation in this setting is lymphadenopathy and fatigue without fever; other manifestations include chorioretinitis, myocarditis, and polymyositis (Box 1). Reinfection occurs but does not appear to result in clinically apparent disease. In contrast to the usually benign course of the initial infection in immunologically intact hosts, the congenitally infected fetus and newborn and immunocompromised patients are at high risk for severe or life-threatening disease caused by this parasite. Congenital toxoplasmosis is the result of maternal infection acquired during gestation. Among immunologically impaired individuals, toxoplasmosis most often occurs in those with defects in T-cell-mediated immunity such as those with hematological malignancies, bone marrow and solid-organ transplants, or AIDS. Primary infection with T gondii in children and adults is asymptomatic in the vast majority of cases. Lymphadenopathy and fatigue, without fever, are the most common manifestations in the minority that become symptomatic. The lymph nodes most commonly involved are cervical, suboccipital, supraclavicular, axillary, and inguinal. Lymphadenopathy is usually regional; often a single posterior cervical node is enlarged. On palpation, the nodes are discrete, nontender, and nonfluctuant. Occasionally, lymph nodes may become matted. Fever, sore throat, maculopapular rash, malaise, night sweats, myalgias, hepatosplenomegaly, or atypical lymphocytes are variably present. The clinical picture may resemble infectious mononucleosis or cytomegalovirus (CMV) infection; however, toxoplasmosis probably causes < 1% of mononucleosis-like syndromes. In rare cases, lymphadenopathy may persist for months. Toxoplasmic chorioretinitis can occur either in the setting of acute acquired infection (sporadic and epidemic) or as a reactivation of intrauterine or postnatally acquired infection. Patients who present with chorioretinitis as a late sequela of intrauterine infection are more frequently in the second and third decades of life (it is rare after age 40); bilateral disease, retinal scars, and involvement of the macula are hallmarks of the retinal disease in these cases. In contrast, patients who present with toxoplasmic chorioretinitis in the setting of acute toxoplasmosis are more often in the fourth to sixth decades of life and most often have unilateral involvement. The eye lesions usually spare the macula and are not associated with old scars. 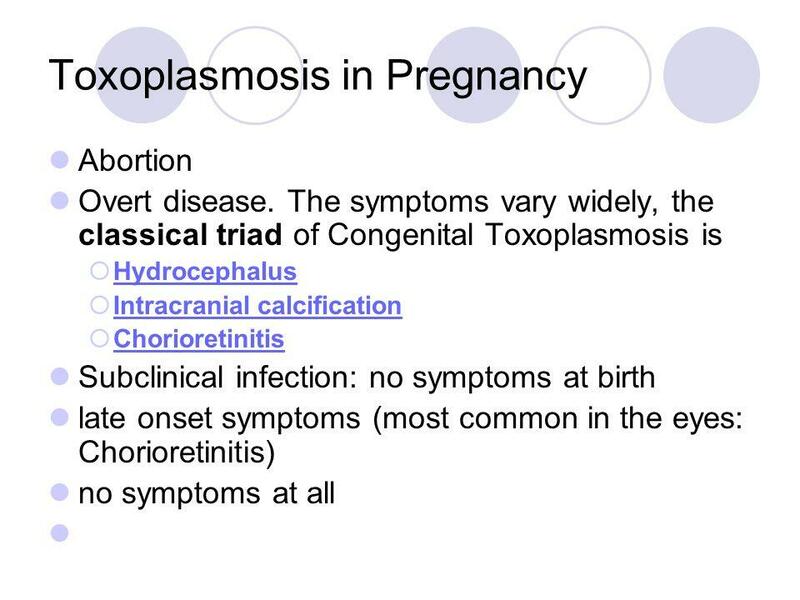 Recognition of toxoplasmosis in pregnancy is important only because of the risk of transmission to the fetus. This risk is limited almost exclusively to those fetuses whose mothers acquire the infection for the first time during gestation. Acquisition of Toxoplasma infection before pregnancy in an otherwise healthy female does not pose a significant risk of transplacental transmission. On rare occasions, transmission to the fetus has occurred in immunocompetent women infected with T gondii within 3 months of conception. In immunocompromised women, such as those with HIV infection, acquisition of T gondii before conception (chronic infection) has then led to transmission to the fetus as a consequence of reactivation. Of newborns with congenital toxoplasmosis, ~ 85% appear normal at birth. Thus, one cannot rely on clinical examination alone to raise the possibility of this disease. However, if untreated, congenital toxoplasmosis will inevitably lead to disease in most infected children. 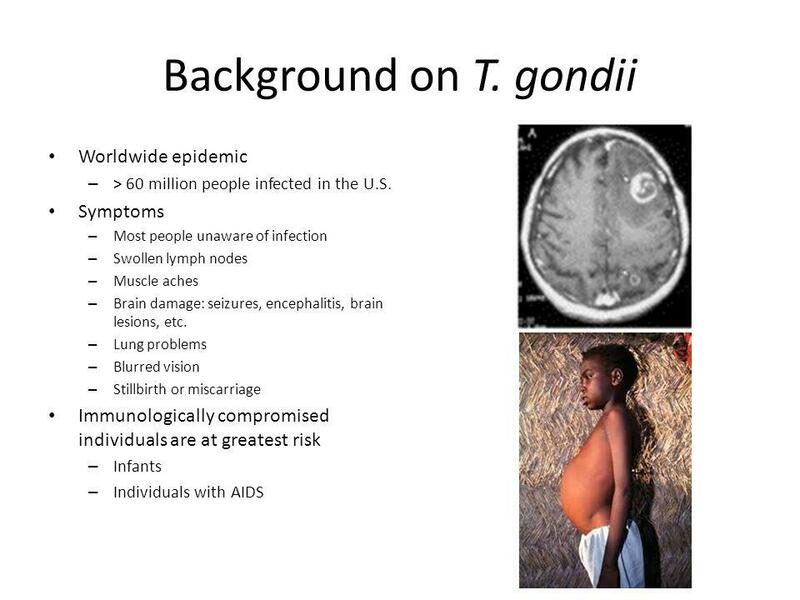 The earlier in gestation a mother is infected with T gondii, the more severe is the disease in the fetus and newborn, despite the lower frequency with which transmission occurs with shorter periods of gestation. Findings include chorioretinitis with blindness, epilepsy, psychomotor disorders and developmental delay, hearing loss, jaundice, rash, hematologic abnormalities, and pneumonitis. The classic triad of hydrocephalus, chorioretinitis, and cerebral calcifications is seen only rarely. In immunocompromised patients, toxoplasmosis almost always occurs as a result of reactivation of previously acquired infection. Toxoplasmosis may also result when a seronegative recipient receives a heart from a seropositive donor. In contrast to the relatively favorable course of toxoplasmosis in almost all immunocompetent individuals, it is a dreadful and often life-threatening disease in immunodeficient patients. In this population, the brain is the most common affected organ. The clinical presentation of TE varies from a subacute, gradual process that evolves over weeks to an acute state of confusion, with or without focal neurologic deficits evolving over days. Clinical manifestations include alteration in mental status, seizures, motor weakness, cranial-nerve disturbances, sensory abnormalities, cerebellar signs, movement disorders, and neuropsychiatric findings. Constitutional symptoms and signs such as fever and malaise are variable. The most common focal neurologic findings are hemiparesis and abnormalities of speech. Because T gondii causes predominantly encephalitis with little or no meningeal involvement, signs of meningeal irritation are rare. Cranial-nerve lesions develop secondary to brainstem involvement. Seizures, cerebral hemorrhage, and diffuse TE may present acutely and progress rapidly to death. Spinal-cord toxoplasmosis in AIDS patients can present with motor or sensory disturbances of single or multiple extremities, bladder dysfunction, and/or bowel dysfunction. Cervical and thoracic myelopathy and conus medullaris syndromes have also been reported. Clinical manifestations of toxoplasmosis in immunocompromised patients also include pneumonitis, chorioretinitis, and multiorgan involvement that presents with acute respiratory failure and hemodynamic abnormalities similar to septic shock. Laboratory approaches for the diagnosis of toxoplasmosis include serology, histology with various stains (hematoxylin and eosin, immunoperoxidase, Wright-Giemsa, and periodic acid-Schiff), isolation of the parasite by mouse or tissue culture inoculation, polymerase chain reaction (PCR), and radiological studies (Table 1). Histologic examination may reveal the characteristic morphology of the parasite in tissues; the presence of tachyzoites or multiple cysts is diagnostic of active infection. The presence of a solitary cyst may reflect chronic infection unless it is associated with inflammation. Almost any tissue can be inoculated into the peritoneal cavity of mice for isolation studies. Several body fluids can be examined by PCR for the detection of T gondii DNA, including cerebrospinal fluid (CSF), bronchoalveolar lavage fluid, vitreal fluid, aqueous humor, amniotic fluid, urine, and peripheral blood. PCR examination of brain tissue is discouraged because a positive result does not distinguish active from chronic infection. For any individual in whom toxoplasmosis is considered in the differential diagnosis, the most important initial step is to determine whether the patient has been exposed to the parasite. In virtually all situations, a negative serum immunoglobulin G (IgG) test essentially rules out earlier or recent exposure to the parasite. Rarely, cases of documented toxoplasmic chorioretinitis and TE have been reported in seronegative patients. If IgG antibodies are present and clinical suspicion is high, it is important to establish whether the patient's condition is caused by a recently acquired infection or by reactivation of chronic infection. A true negative IgM antibody test essentially rules out acquisition of the infection within the previous 6 months; however, it does not rule out reactivation of chronic infection. A positive T gondii-specific IgM antibody test can be interpreted in three ways: (1) as a true positive result consistent with recently acquired infection, (2) as a true positive result in the setting of a chronic infection (IgM antibodies have been shown to persist for as long as 5 years after the acute infection), or (3) as a false positive result. To establish which of these is most likely in a given case, confirmatory testing in a reference laboratory should be performed whenever feasible. Confirmatory tests include the Sabin-Feldman dye test, IgM enzyme-linked immunosorbent assay (ELISA), IgA ELISA, IgE ELISA, and differential agglutination test. These tests are available at the Toxoplasma Serology Laboratory at the Palo Alto Medical Foundation (650-853-4828). If the patient has received a blood transfusion, serologic tests may measure antibody acquired exogenously rather than endogenously. The use of serological tests to evaluate the response to therapy should be discouraged. Despite the crucial role played by members of the feline family in the life cycle of T gondii, a history of cat exposure is not particularly helpful in assessing the likelihood of toxoplasmosis in a given patient. Transmission of T gondii almost always occurs without the awareness of the patient and may be unrelated to direct exposure to cat feces (eg, transmission of oocysts by contaminated vegetables or water). On the other hand, cats that remain indoors at all times and that are fed only cooked food do not pose a risk to humans. Serologic examination of cats should be discouraged; seropositivity does not predict shedding of oocysts. The diagnosis of toxoplasmosis in the vast majority of immunocompetent adults and children relies on serological tests. Recently acquired toxoplasmic lymphadenopathy is easily diagnosed serologically, but, unfortunately, it is not often suspected until after lymph node biopsy. Acute infection is supported by the documented appearance of IgG or IgM antibodies or by a greater than fourfold rise in antibody titer. Histology of appropriate specimens (lymph node or myocardium) may be helpful. In most cases, toxoplasmic chorioretinitis is diagnosed by and treatment initiated on the basis of ophthalmologic examination and serology test results. PCR analysis of vitreous fluid or the measurement of intraocular production of T gondii-specific IgG antibodies may be useful in patients with presumed toxoplasmic chorioretinitis in whom response to appropriate anti-Toxoplasma therapy is considered inadequate or suboptimal and in patients with atypical eye findings. The first step in addressing the possibility of toxoplasmosis in pregnancy is to establish whether acute infection has occurred. In the vast majority of cases, the diagnosis of acute infection during pregnancy is only possible with serological testing (Table 2). A serological diagnosis should be confirmed by a reference laboratory because the reliability of commercial IgM test kits varies considerably and because the presence of IgM antibody does not necessarily establish the diagnosis of the acute infection (see above). Prenatal assessment of fetal infection should be performed when a diagnosis of acute infection is established or highly suspected in a pregnant woman. Amplification of T gondii DNA by PCR and/or isolation of T gondii from amniotic fluid establishes the diagnosis of fetal infection and has entirely replaced the testing of blood samples obtained by periumbilical fetal blood sampling. Examination of amniotic fluid should be performed at 18 weeks. The reliability of the PCR test before 18 weeks of gestational age is unknown. The sensitivity of amniotic fluid PCR is ~70%. The sensitivity of inoculation of amniotic fluid into mice for isolation of T gondii is ~ 60%. The specificity of the PCR test is close to 100%. Ultrasonography is a useful test to establish the severity of the infection; however, it should not be used to confirm or rule out congenital toxoplasmosis. Abnormalities frequently reported with this method in cases of in utero infection include ventricular dilatation, intracranial calcifications, increased placental thickness, hepatic enlargement, and ascites. The diagnosis of congenital toxoplasmosis in the newborn can be made by detecting specific IgA and IgM antibodies. Serum samples from the newborn should be obtained from peripheral blood and not from the umbilical cord, because it is essential that maternal contamination of blood obtained at birth be excluded. The presence of IgG antibodies in the newborn may reflect passive transplacental transfer of maternal antibodies. Other laboratory tests available for the diagnosis of congenital disease in infants include isolation of the parasite in mice or cell culture (eg, from placental tissue or body fluids) and PCR with body fluids, such as CSF, blood, and urine. Clinical evaluation of infants with presumed T gondii infection should always include ophthalmologic examination, radiologic studies (particularly to detect the presence of cerebral calcifications), and examination of CSF. It is important to maintain a high index of suspicion for toxoplasmosis in immunodeficient patients because its clinical manifestations are protean and nonspecific and, if left untreated, toxoplasmosis is a source of major morbidity and mortality. 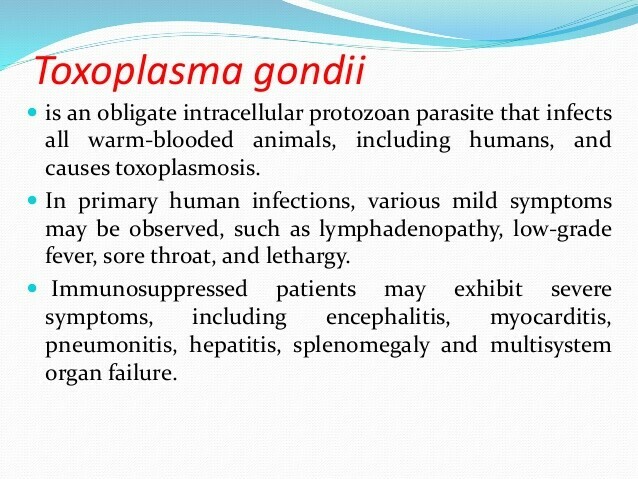 Because reactivation of chronic infection is the most common cause of toxoplasmosis in AIDS- and non-AIDS-immunocompromised patients, the initial routine assessment of these patients, even in the absence of signs of toxoplasmosis, should include a serum T gondii IgG antibody test. Those with a positive result are at risk of reactivation of the infection; those with a negative result should be instructed on how to prevent infection. The anti-Toxoplasma serologic status of heart transplant recipients should be routinely assessed before transplantation, and an appropriate prophylactic regimen should be instituted for all seronegative hosts if they receive a heart from a seropositive donor. A definitive diagnosis of toxoplasmosis in the immunodeficient patient relies on histologic demonstration or isolation of the parasite or PCR-based detection of its DNA. In AIDS patients, CSF examination by PCR has been found to have a sensitivity of ~ 80% for the diagnosis of TE. CSF PCR for other organisms has also been found to be helpful in patients with AIDS, including amplification of Epstein-Barr virus, CMV, and JC virus DNA for the diagnosis of primary CNS lymphoma, CMV ventriculitis, and progressive multifocal leukoencephalopathy, respectively. Computed tomography (CT) or magnetic resonance imaging (MRI) should be obtained when clinical manifestations suggest involvement of the CNS or spinal cord. These studies should be performed even if the neurological examination does not reveal focal deficits. MRI is the radiological test of choice and is more sensitive than CT.
A presumptive diagnosis of CNS toxoplasmosis can be made for patients with multiple ring-enhancing brain lesions (usually established by MRI), positive T gondii-specific IgG antibody titers, and advanced immunodeficiency (eg, CD4 count < 200 or patients who receive intensive immunosuppressive therapy) and justifies anti-Toxoplasma therapy. A clinical and radiologic response to specific therapy within 7-10 days supports the diagnosis. Brain biopsy should be considered in immunodeficient patients with suspected TE if there is a negative IgG antibody test, a single lesion on MRI, inadequate clinical response to an optimal anti-Toxoplasma treatment regimen, or development of disease in the face of an effective prophylactic regimen against T gondii. In heart transplant patients who present with a clinical syndrome that suggests toxoplasmosis, serologic test results may be misleading. Results consistent with chronic infection may be seen in the presence of acute toxoplasmosis. On the other hand, results that suggest apparent reactivation (rising IgG and IgM titers) may be found in the absence of clinically apparent infection. In these patients endomyocardial biopsy is useful.